An Irish Breakfast is not just a breakfast but it is a fully cooked meal. Traditionally the main ingredients are bacon rashers, sausages, fried eggs, white pudding, black pudding, fried tomato and sautéed mushrooms. In addition to this fry-up extras include: brown soda bread, a strong Irish breakfast tea served with milk and fried potato bread, boxty or toast like alternative to brown soda bread. It can vary from one family home to another, but the fry-up remains the same. 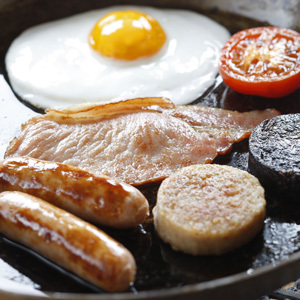 In a large frying pan put the butter fry the bacon, sausages, Black and White pudding until brown. Fry eggs, chopped tomatoes and mushrooms until cooked. Serve the fry-up with brown soda bread and a pot of hot Irish breakfast tea.